TemplateHack.com - Download winters premium blogger template. Hello again! Today I will share one of most responsive and SEO Friedly blogger template. The template name is Winters. 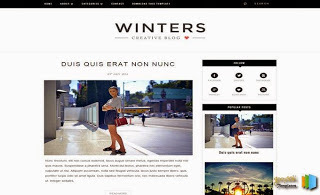 Winters is a elegant and stylish blogger template. Winters blogger template has really great look and is perfect for your personal blog. Winters blogger theme will help you to get a unique look for your blog as it has many features. Winters blogger template is perfect to display daily articles in a beautiful way, the design is responsive meaning the theme looks just perfect for devices such as Android, iPhone, Windows Phone and desktop, it has a great post format gallery which creates the possibility for you to display images from various format.